Reading on anything to do with the Second World War is an intimidating task, since the literature is so vast that it seems impossible for any laymen to identify relevant books or simply those well enough written to deserve notice. Military history remains a topic of high interest, and serious studies often drown in the flood of available popular editions, autobiographies or “collections” of pictures, technical data or battle descriptions. For those of us without access to a well-stacked library, stonebooks.com is an invaluable source, providing a structured catalogue of publications. Fleshed out with book reviews, a message board and and more catalogues of publishers and authors, stonebooks provides a great service for readers and historians alike. Our hobby seems for most cases to be stuck in the early 00’s when it comes to design and usability, and stonebooks.com is no exception. However, we would ask our reader again for leniency: The website proves without a doubt one does not require Bootstrap to provide viewing pleasure. Additionally the author of the page, Bill Stone, is one of the oldest Europa veterans and former editor of E.T.O. Say Hi and grab a good book! More work done: I’ve enlarged the Academy and created sub-pages for essays and documents. 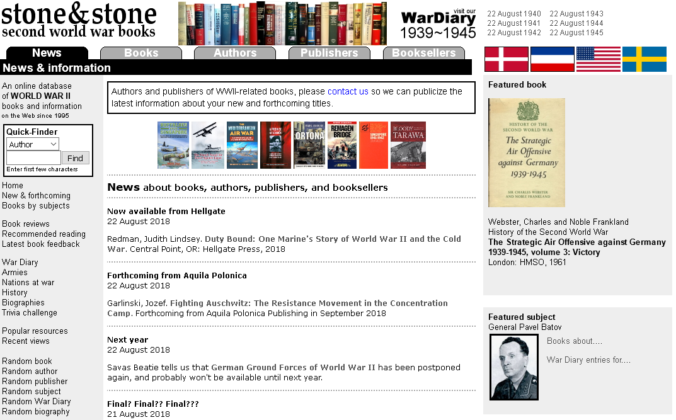 The library now contains links to nearly all available official histories of World War I, while the page about WW 2 is being built. The corpus of links has grown sufficiently I believe to justify converting it into permanent pages. Also, the title of this post refers – of course, to the victory of the great Timur Tamerlan over the Indian Sultan in 1398.